2: Story Behind the Photos: Quiet Riot. You would have to live under a rock to not know teaching and learning are under attack in this country. As teachers we feel helpless. Cogs in a machine helpless. Jen, Larisa, and I quietly boarded a coach early in the morning in East Syracuse and sped off to our state capital. It was like heading into war. Bus after bus of soldiers. No guns, our weapons, were markers and grammatically correct signage. A polite group of people who were sick and tired, of being sick and tired. You could see it on their faces. We knew complaining about our plight in the teachers’ lounge was going to bring no relief, but how on earth would shaking a sign matter? We went that day to make a very small ripple in the universe. There was an uneasiness in the group as we stepped off the last stair and were led to the rally. We had never trained; teachers are good at turning the other cheek. I brought my camera to tell the story. I walked around the reflecting pool of Empire State Plaza and headed to the back of the crowd. It was a huge concrete oasis, unusual buildings with large facades lining the rectangle. There was a lot of shouting and lots of signs and I had to get away. My introvert kicked in and I needed quiet time. I walked to the back, what seemed like miles away from the shouting crowds. You could hear the megaphones in the far distance. On my way back I spotted this man, sitting on a bench, fighting his own way. No screaming, no shouting. Just a determined man with his Diet Coke. I asked if I could take his picture, and he quietly said yes. I wonder what he taught? Was he an introvert or a pacifist? 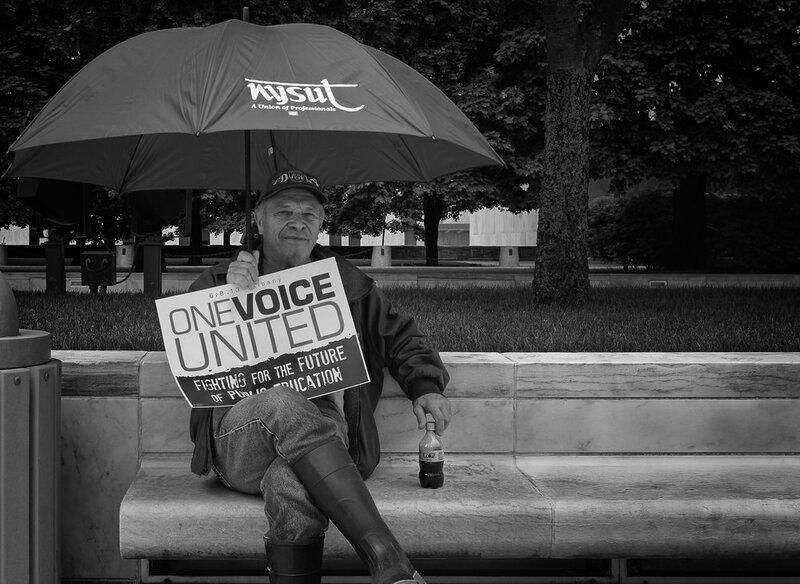 He held his NYSUT umbrella and fought the good fight. He was making a ripple in the universe. I wish I had asked him his story, I bet it was a good one. Here is the photo of the man that day.